Why Do They Approve of Sin? I set your rules before me.” Psalm 119:30 English Standard Version (ESV). Thank you for joining us, as we prayerfully continue the Feast by reading Deuteronomy Chapter 13; “Enticers to idolatry to be put to death. (1-5) Relations who entice to idolatry not to be spared. 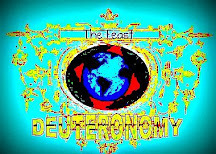 (6-11) Idolatrous cities not to be spared. (1-5) (12-18)“ – Matthew Henry Concise. Here we see a city revolting against the laws of our God. “12 “If you hear in one of your cities, which the Lord your God is giving you to dwell there, 13 that certain worthless fellows have gone out among you and have drawn away the inhabitants of their city, saying, ‘Let us go and serve other gods,’ which you have not known, ” Deuteronomy 13:12-13, ESV. There are cities like this today, yesterday I the news they annunced that Santa Ana will join other cities by flying tha Gay Flag. “SANTA ANA – · By the end of summer, Santa Ana could be the first city in Orange County — and one of the only cities in the country — to fly the gay pride flag outside city hall, next to the national flag and the California state flag.” Orange County Register`, July 20, 2015. They are joining many other cities across our country in celebrating sins of the flesh; “21 For although they knew God, they did not honor him as God or give thanks to him, but they became futile in their thinking, and their foolish hearts were darkened. 22 Claiming to be wise, they became fools, 23 and exchanged the glory of the immortal God for images resembling mortal man and birds and animals and creeping things.” Romans 1:21-23, ESV What the residents of these cities need to know is what they are approving and how it will affect them; “28 And since they did not see fit to acknowledge God, God gave them up to a debased mind to do what ought not to be done. 29 They were filled with all manner of unrighteousness, evil, covetousness, malice. They are full of envy, murder, strife, deceit, maliciousness. They are gossips, 30 slanderers, haters of God, insolent, haughty, boastful, inventors of evil, disobedient to parents, 31 foolish, faithless, heartless, ruthless. 32 Though they know God’s righteous decree that those who practice such things deserve to die, they not only do them but give approval to those who practice them.” Romans 1:28-32, ESV. That’s it by approving this sin they are putting their selves and their children in danger of death in their sins. The reason I mention this is our God doesn’t want anyone to die in their sin; “9 The Lord is not slow to fulfill his promise as some count slowness, but is patient toward you, not wishing that any should perish, but that all should reach repentance.” 2 Peter 3:9, ESV. That being said I feel that the time is near; Come Lord Jesus! I send the Feast out as the Holy Spirit inspires me. I send the Feast out as the Holy Spirit inspires me. If the Lord is willing I’ll send and post the Feast again tomorrow. Posted by mstanj on July 21, 2015 in bible, thanksgiving.